Brooke Bolander’s debut novella is a blistering, elegiac, and richly imagined work. It is ambitious in its aims and in its techniques, grounded in Bolander’s acute talent for voice and for flaying open the wounds of the world. Bolander twines together four separate voices, sliding adroitly between an alternate-historical past, multiple points along an imagined future, and a mythic no-time of elephantine thought and story, the legends and singing of the Many Mothers. When it succeeds it is masterful. Three of these threads are excellent, sometimes even exquisite; the fourth—the future-timeline of the political negotiator Kat—is weaker, and this weakness reveals the structural flaws in Bolander’s execution of her project. The heart of this book is in the central two narrative threads: the interweaving of the terrible death of Topsy the Elephant, electrocuted in a public execution in Coney Island’s Luna Park for killing her violent and abusive human handlers, and the industrial horror story of the Radium Girls, female watch-dial factory workers who contracted radiation poisoning and cancers of the bone and jaw from shaping the points of their radium-soaked paintbrushes in their mouths. This pairing is a potent one, as unexpected as it is cohesive in its indictment of the early 20th century’s treatment of the oppressed. It is accomplished via Bolander’s graceful collapse of approximately 20 years of history; in our world, Topsy died in 1903, while the Radium Girls were subjected to their horrors between 1917 and 1926. But this alternate history is signaled by the sentience of elephants, who can communicate with humans via a type of sign language. Given that elemental difference, this reader, at least, was entirely willing to believe in the collapse of time periods, especially considering the power of overlapping the brutality of the murder by electrocution of an elephant (John Donne’s “the only harmless great thing”) with the brutality of radiation poisoning and industrial abuse of workers. Another human pushes out of the mass—the dead girl, still moving, still somehow on her feet when every part of her stinks of corruption. […] She turns, asking in the language of twisted trunk-paws: Are you well? Can you walk? It’s just a little further. We’ll go together. And even this much We is enough to drive the fear back into the high grass. Her mind stills. Her legs unstiffen. Together they cross the overwater, men flytrailing behind. Together they go to sing the song of their undoing, the joining, teaching, come-together song. The culmination of Regan and Topsy’s two stories intertwining is a nuclear explosion, set off when Topsy—vial of radioactive material in her mouth, led to the place of her execution by Regan—is electrocuted. This is the last event of the novella, and highly telegraphed throughout it. We are not surprised by this ending. 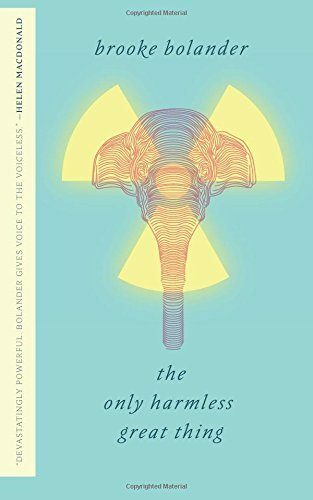 Bolander opens her story with a vivid description of a contaminated nuclear site, and the irradiated elephants who live there long past any continued human civilization; Topsy’s last act is also reflected through the third intertwining thread of the book, a future history in which the explosion in Luna Park has become part of the popular culture of an America still grappling with the fact of sentient elephants and how they have been treated by humanity’s great industrial machines. However, in the last moments of the book, we are not given the catharsis of seeing the explosion—even in a single line, even in a brief image. Bolander chooses to end with the above-quoted lines and a segment of mythic poetry from the Many Mothers, the elephants who remember everything in song, even Topsy’s death. The reader is left waiting, wanting the catharsis of yes, and this is how it happened. We already know it will; we have just been given the gift of seeing Regan and Topsy’s strange solidarity transfigured, Regan made into a psychopomp bearing both death and the way toward death. But we are denied the culmination. This is clearly a deliberate choice of Bolander’s. Perhaps we are not meant to see something which is so clearly mythic, nearly supernatural—an event which is immediately made into an elephant-song, preserved forever. Nevertheless its lack makes the novella feel abrupt, cut off: like a ringing chord abruptly muted. Nor is this the only structural problem with The Only Harmless Great Thing. As stated earlier, Bolander’s facility for assembling and lacing together a multitude of voices (not only Topsy, Regan, and the negotiator Kat, but also news clippings and snippets of popular culture from the novella’s alternate America, the songs of the Many Mothers, and an elephantine myth about how the Furmother rescued stories from captivity and shared them with all elephants) is exceptional, lucid and affecting. The trouble lies in the relationship of the third major thread—Kat’s thread, the negotiator trying to make a deal with a representative of the elephants—to the story of Topsy, Regan, and the dual memories of America and the Many Mothers. Kat is a research academic and a diplomat, tasked with getting elephants to agree to a genetic alteration which would make them glow when near nuclear waste, like living Geiger counters. She is trying to solve the problem of making sure that future civilizations know that nuclear waste sites are dangerous: the “this is not a place of honor” problem. Her solution derives from the apparently pervasive cultural meme of “glowing elephants = dangerous” which has been created by Topsy’s nuclear execution. Kat is not terribly good at her job as a diplomat; she comes to her negotiation with only an ask, rather than anything to bargain with. Nevertheless she manages to prevail (and we see the results of her work in the first scene of the novella, full of luminescent elephants), while having doubts about her own complicity in the project of making the elephants again servants of repairing humanity’s industrial horrors. Kat’s thread is narratively useful in two ways: first, it gives the reader a glimpse of the future created after Topsy and Regan, because of Topsy and Regan; and second, it recapitulates Bolander’s themes of complicity, solidarity, and the ways oppressed people can use each other or uplift one another. And if Kat’s thread had been as clear to interpret and read as I have described it here—and if it was believable that glowing elephants would be a cultural meme which could last ten thousand years, emanating from one single event in one part of the world—it would be very successful indeed. Instead, Kat is the least compelling of Bolander’s protagonists, and her story feels both emotionally unresolved and insufficiently convincing. Reduced, in her sections, are the vivid voice-work that characterizes Regan, or the hallucinatory beauty of the Many Mothers, or Topsy’s alien and sensual rage; Kat is the least distinct of any of the voices in this novella. Neither is her storyline tightly integrated with the others in a way which links up logically; her sections feel like they come from some other book, a book in which the thread of Topsy and Regan is the backstory. It is not that Bolander’s choice of adding a third protagonist from her America’s future is an error—rather, it is a compelling choice, considering that so much of this work revolves around the persistence of memory. Seeing the world as created by Topsy and Regan in Luna Park provides the propulsive telegraphing of Topsy’s end which successfully drives the pacing of the novella. But is Kat, and her story, the best choice of third protagonist? Kat’s story is bloodless compared to Regan’s (all stories are bloodless compared to Topsy’s and the Furmother’s), and its scientist’s distance weakens the overall structure of the book. Here I would point to Bolander’s own pre-publication blog post on Tor.com, “Fire, Phantoms, and What Didn’t Make It Into The Only Harmless Great Thing,” as evidence that there might have been other choices, other futures to showcase, ones which would have been more tightly bound to the power of Topsy and Regan: a ghost story, a haunted Luna Park that burned over and over again, full of the spectral evidence of murdered elephants. The Only Harmless Great Thing is already about memory, and the ways it persists and vanishes. Including the ghost of Topsy, haunting the ruins of a burning, radiation-poisoned Coney Island, and seen by a protagonist from the future, might have been a more fruitful path for Bolander to take with this thread. It seems to have been one she considered and discarded. Despite these structural shortcomings, The Only Harmless Great Thing is a triumph of invention, language, and message; it is profoundly original, vivid, gruesome when necessary, shocking and unexpectedly beautiful in turn. This is Bolander’s first long-form work. We as readers of speculative fiction have an enormous amount to anticipate from her in the future. Arkady Martine is a speculative fiction writer and, as Dr. AnnaLinden Weller, a historian of the Byzantine Empire and a city planner. Under both names she writes about border politics, rhetoric, propaganda, and the edges of the world. Arkady grew up in New York City and, after some time in Turkey, Canada, and Sweden, lives in Baltimore with her wife, the author Vivian Shaw. Her debut novel, A Memory Called Empire, comes out in March 2019 from Tor Books. Find Arkady online at arkadymartine.net or on Twitter as @ArkadyMartine.